We believe that by providing the care and guidance seniors need, by building trust and creating relationships – we can create better lives for them and their families. Amada Senior Care, premier provider of non-medical in-home care and assisted living placement counseling, recently opened a new office in the greater Pittsburgh area – their North Huntingdon, Pennsylvania location. Amada franchise partner Joe Spehar decided to make the move to senior care with his purchase of the rights to the area after years of experience in the medical device and biotech industries. Joe is running the business with his wife Amber and his sister-in-law Shelley. Their grand opening will be held on Thursday, July 9th. When asked what makes Amada different from other homecare companies, Joe said that Amada Pittsburgh not only understands the impact that quality care can have on a senior and their family – they understand the healthcare landscape in general and are here to guide seniors through it. The grand opening of Amada Senior Care Greater Pittsburgh will take place on Thursday, July 9th. The office is currently looking for qualified full and part-time caregivers to work with their clients. For more information, you can visit their website at http://www.AmadaSeniorCare.com/GreaterPittsburgh or call 724-305-6532. Amada Senior Care is committed to enriching lives. We provide nurturing, compassionate non-medical in-home care and guide families through the many senior housing options available for assisted living. We also offer expertise in handling long-term care insurance claims and in certain forms of government aid, including Veterans Aid and Attendance Benefits. 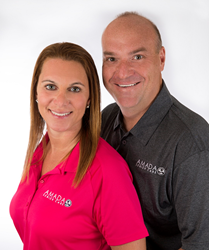 Headquartered in San Clemente, California, Amada was founded in 2007, and is currently assembling an elite team of franchise partners to expand our business on the national level. For more information, visit amadaseniorcare.com.